Send us pictures of your screening rooms and theaters! CLICK HERE to read the policies on submitting pictures. 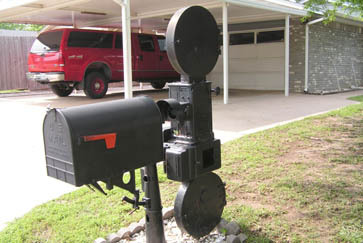 Now that's a mailbox! How many pieces of US mail get to be delivered to a Model K Motiograph on a SH7500 soundhead? All of Ben Kehe's mail does. Ian's BIG Trip to Bradford - Ian is a big man and this is his big trip! Movies in the Park - Celebrate Brooklyn's outdoor film mega show! Telluride Film Festival 1999 - Need we say more? ShoWest 2001 QSC Paris Ballroom sound rack - A must see! Ontario Place Cinesphere - The very first 15/70 projector ever built! GCC Northpark 1 & 2 - A true 'show' theater! Granada Movie Grill - Greenville - The original movie grill, now closed. Final closing pictures. Lake Street Plaza Cinema - Extra clean booth! National Geographic Society's Gilbert H. Grosvenor Auditorium - Whew, that was a long name ... but a very cool facility! Astro Drive-In - The biggest screen in the south! Marysville Drive-In Theatre - Owned and operated by Film-Tech member Bob Golding. Century 16 - Self-serve concession stands! Cinema Latino - Fort Worth - A multiplex dedicated to all Spanish language (or captioned) movies. Cineplex Odeon Eaton Centre Theatre - 17 screen with 16mm and rear projection, all built in an old parking garage! GCC Carrollton 6 - Beware of the operator! Lacey Cinemas - Hope the film doesn't break. Legacy 24 - Cinemark's flagship theater! Les Rialto 7 - unknown location ... what's up with that? Loews Cineplex Dupont Circle 5 - Projection using mirrors to bounce the image through vents and such to the screen! Madstone Theaters Tamarac 6 - Formerly Mann's Tamarac 6 in Denver. New art venue that offers picture AND sound in every auditorium! Mann's Tamarac Square - The moviegoing experience doesn't get much better than this! Studio 28 - The world's first 20-screen theater. It started as a drive-in and then just kept growing! Studio Movie Grill Arlington - A 9 screen ground up dinner and a movie build. Studio Movie Grill Arlington construction photos - 100 construction photos from beginning to end. Studio Movie Grill City Centre - The world's first truly automated projection booth. Studio Movie Grill Dallas (at Royal Lane) - New SMG dinner theater opened Feb 4, 2008. The United Artists - What a name for a theater! Tinseltown USA - Flagship of the 'Tinseltown' line of theaters. Features Iwerks ride. Located in Plano, Texas. UA Marketplace Movies 6 - The dreaded teenage projectionist attempts to thread! Warner Village Starcity 30 - Largest theater in the UK! 16mm on a Platter? - You bet! Chicago Cinema Museum - Great nostalgic stuff! Interlocking 101 - Pictures from the video! Showscan - 70mm at 60 frames per second! The Joe Redifer Private THX Cinema (Parody) - Andy Summers' theater just isn't impressive anymore after seeing Joe's setup!